This post is about people who share videos on Facebook or other social media sites long after they came out. I kind of feel bad for people who are excited to share funny new stuff they have recently discovered but they don't realize it is ancient history as opposed to fresh news. 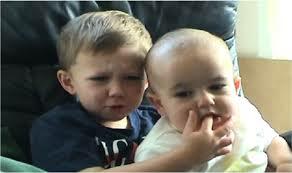 They share links like ""Charlie bit my finger" or "Star Wars Kid" years after everyone else has seen them. I have noticed that this usually happens with older folks who are a little slower on the pop culture/social media uptake. I also just realized that I fit into the older folks category since I am a now a grandpa, but I still feel young at heart. I actually don't mind people sharing videos long after they were popular. It's not like they are dairy products that will go bad after a certain date, but it's just that I can tell they are expecting to get a big reaction from viewers but instead get a "oh yeah I saw that 9 years ago when it came out." The videos listed below are the type of stuff I'm talking about that I still occasionally see someone post expecting to get a fresh reaction from viewers. Anyway, I hope I don't come across as a snob with this, I just wanted to express my condolences to the people who don't know how long some of those videos have been around. By the way I just came across this funny commercial I thought you guys might get a kick out of it.